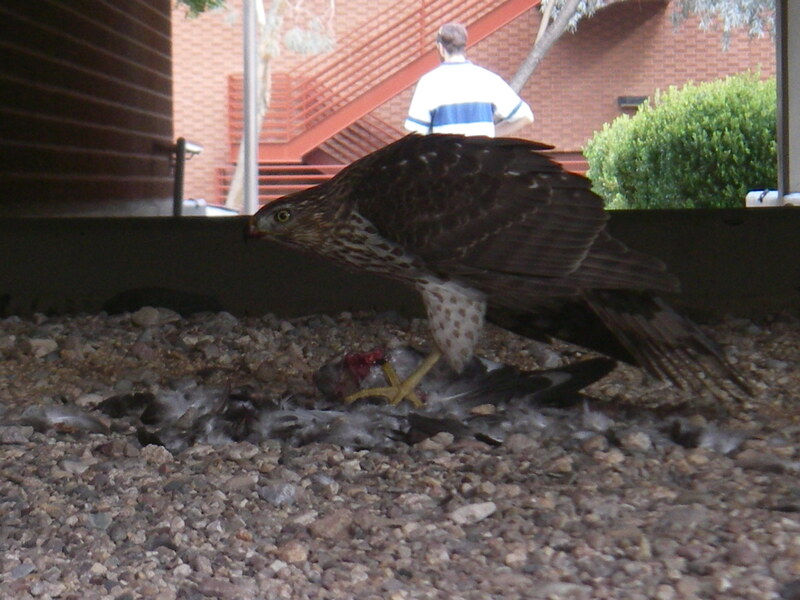 Cooper's hawk (Accipiter cooperii) eating a mourning dove under the stairs to BioSciences West building on UA campus in November. It was right there in the shadows under the stairs, glaring lidlessly at me with its round yellow eye above the sharp, bloody beak. A cooper’s hawk had caught itself what looked like a mourning dove (thanks for the ID’s, Max! ), possibly at one of the campus feeders. An urbanized bird, it was vigilant as it ate, but unbothered by my photographing it from barely ten feed away or the laughing students passing by with cafeteria lunches or in gym clothes. As I watched, a little mouse ran through the open dirt of the planter where the hawk was feeding, and up the concrete wall before disappearing into the bushes. A brave little guy, I thought at first. Or was it cagey? Did it understand the hawk posed no danger while occupied with its current meal? The time and effort it takes for the hawk to pluck the feathers and gorge itself on the insides of the dove is what biologists call “handling time” (thanks to Hollings 1959) and this hawk spent at least an hour at it. Handling time is important to models of predator-prey dynamics, because without handling time, predators can eat everything they encounter. That results in different system behavior than when there is some level of satiation, when the predators cannot or choose not to eat one more bite (like us before Thanksgiving dinner, eating everything in sight versus after stuffing and cranberry sauce – satiated). All these different models can make very different predictions about how biologically diverse a place “should” be. All the models are, of course, wrong (they are all simplified versions of the real world), but some are useful. As my advisor, Peter Chesson, frequently reminds me, good modeling is driven by the biology of the system. The math and the biology should agree. Yet biologists have argued for a long time about whether predation or competition are more important forces regulating ecosystems. This was officially kicked off by a paper in 1960 (by Hairston and others) that hypothesized the world is green because predators of plant-eaters keep them from eating all the plants. But isn’t competition important too? I think so – I saw some last weekend. 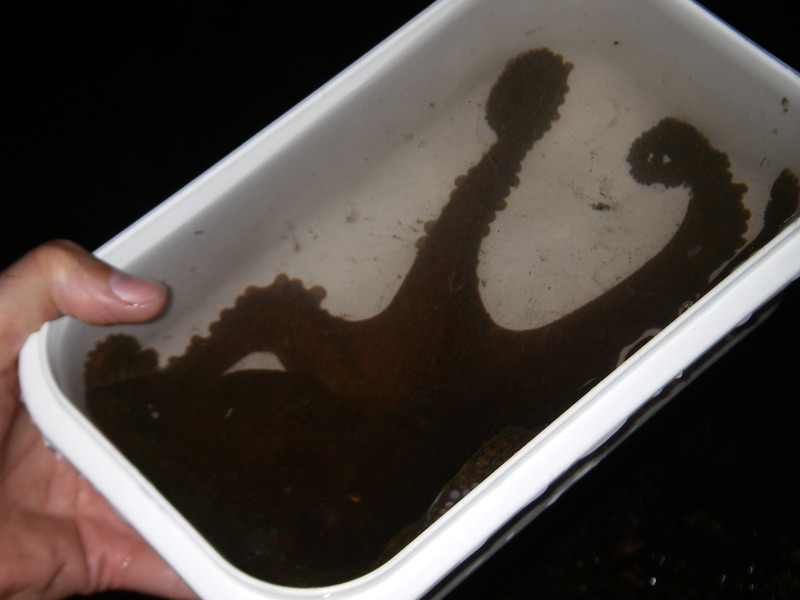 A two-spotted octopus (Octopus bimaculatus) that squirted ink right into the lead instructor's face. Over the weekend, I went to Mexico in my role as the Graduate Teaching Assistant for Conservation Biology. We hiked and camped through the borderlands and lava flows all the way to the beach where we scavanged the tide pools for octopus and the 23-legged sunstars. Sunstars were once top predators in this system. They all but disappeared in the 1990s, and no one knows why, but they are coming back now. 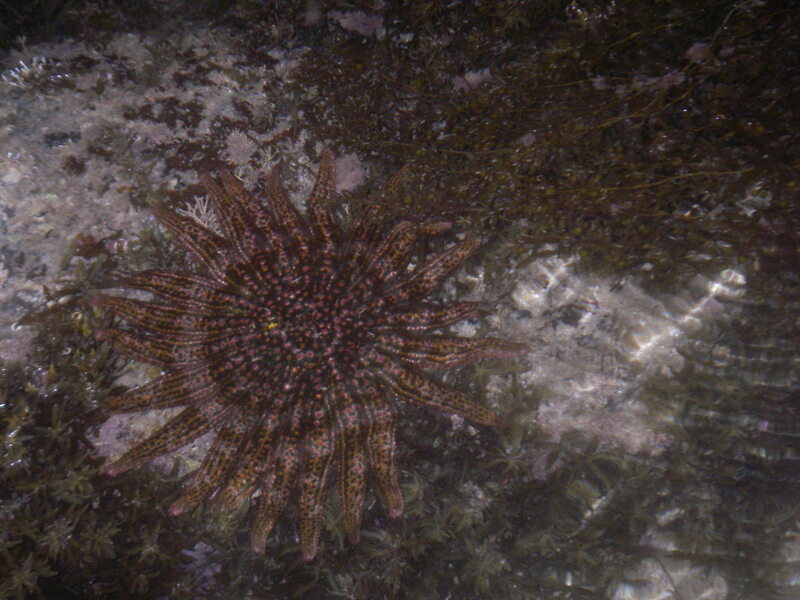 Anemones competing for space on a rock. 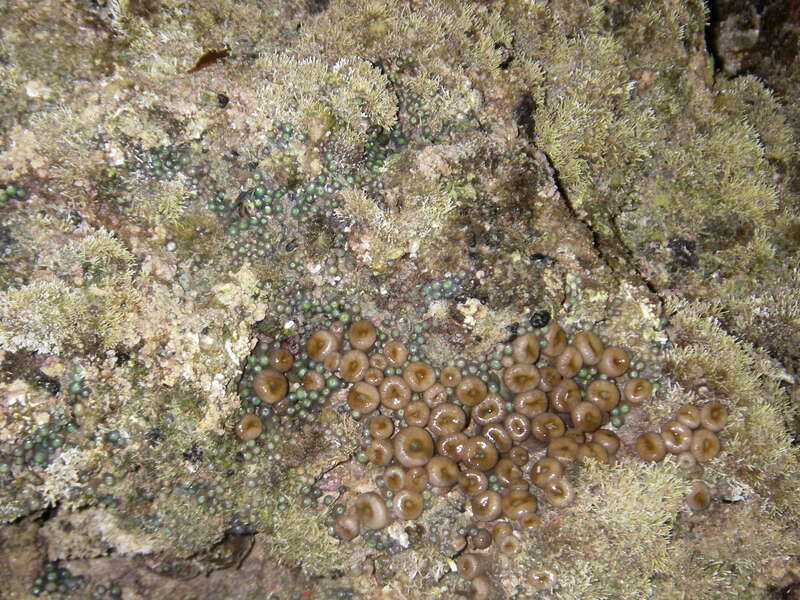 While there, I took this picture of brown carpet anemones and a competing green anemone elbowing one another for space among the algaes on this rock. My guess there is that they directly compete for space. This kind of competition is kind of a lottery (Sale 1977). Each time one dies, a prize spot opens up. Its (now former) neighbors have all bought all the tickets they could by producing as many little gametes as possible, which turn into larvae. Further north, in the desolate lava flows and Maar craters and drifting dunes of the Pinacate Biosphere Preserve, I was startled to see so many plants growing there. The annual 3 inches of rain supports dozens of reptiles and mammals, too! Even big pronghorn antelope! How might you model the competition of the plants for the water? Bill Ricker has a model that makes growth of each individual decrease exponentially as other individuals compete for its resources. All that is a lot to learn from to explain biodiversity, agriculture, cities, global warming’s effects, etc. Here’s a question: what do you think ecologists should use these to answer? If you got to ask for ecology’s next top model, what would it model? What would it tell us? Ricker, WE (1954). Stock and recruitment. Journal of the Fisheries Research Board of Canada. Being a scientist is not so different than being a reporter or a detective, but much less conducive to making action movies. I am on to a new case that (if it all goes well) may define the course of my dissertation. The crime: buffelgrass, a suspect you already know from my post a month or two ago, has been accused and convicted of invading the desert and decreasing biodiversity. The new twist: A recent PhD student from University of Arizona smelled a rat, you might say. The result: a new “personality of interest” has been fingered as potentially involved: the rodent community. Has that community been complicit? An innocent bystander? A silent victim itself? Or a shady superhero quietly attempting to ameliorate the damage? Sounds like a case for Pacifica Sommers, Private Eye. So I have been busily writing applications for fellowships that would allow me to focus on research instead of teaching. Like any good detective, I have been interviewing experts and reviewing the documented evidence day and night, fueled by coffee binges and Halloween candy (sorry trick-or-treaters). For these research proposals, I have to get to the bottom of the story, preparing the reader for the exciting climax where I put myself in a dangerous position in order to confront the culprit and reveal the answer. And there’s where being a scientist gets a little less exciting in the action movie sense. 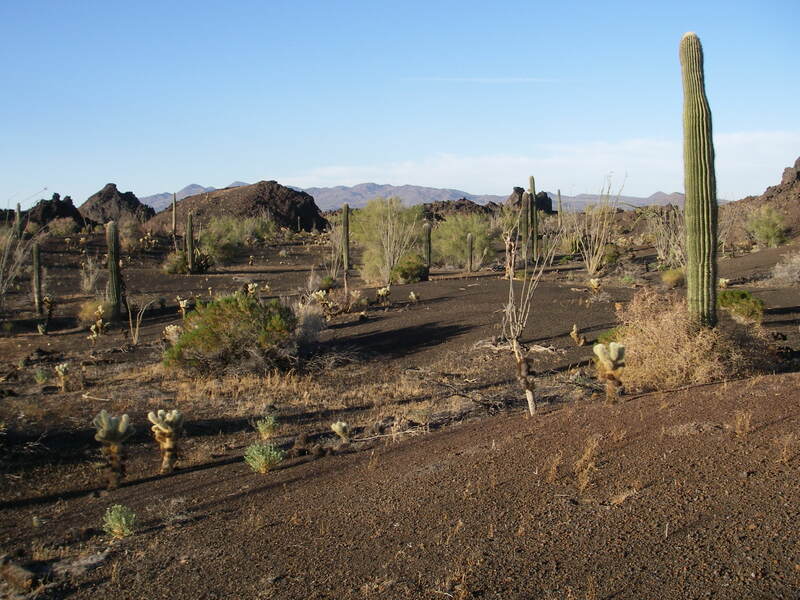 Instead of one night of tunneling under the suspected site of the crime, pistol concealed in my pocket and tape recorder running, I will spend years tramping all over the mountains surrounding Tucson, digging in cages and measuring trees and trapping rodents. I will spend countless hours between in my underground office, gritting my teeth as I troubleshoot the latest MATLAB program that is generating the theoretical predictions I am testing out in the field. On the upside, if you hire this private eye, the danger pay should be lower than if I were sneaking about with pistols in the dark.